If you're anything like me, you are going to find yourself going to a baby shower, giving a baby shower or being the one having a baby! There are SO many people having kids right now. I just got back from a shower today for my Best Friends daughter. (They're having a baby girl...the 1st after 3 boys!!) 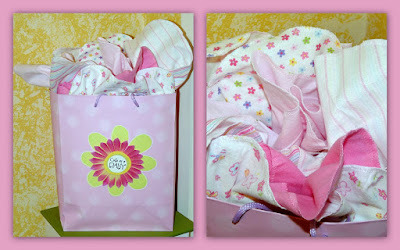 The gifts were bought but I forgot to get some tissue paper so I came up with this idea, using a 5-pack of receiving blankets as the tissue paper for the gifts. Nothing to throw away and it looks so CUTE!